The few. The proud. The brave folks who have been selected by CIG to test things before they arrive to an alpha test. And now, they can be listed as among the first to get their hands on the Star Citizen 3.0 update according to reports on Reddit. It looks like the hotly-anticipated update to Star Citizen is making its first major inroads to the playerbase, as images posted on the Star Citizen subreddit confirm the Evocati Test Flight server is now housing an early version of 3.0. According to a creenshot from the Star Citizen Discord, testing will be broken up in stages and will focus on “modest testing goals” as a result of the update’s size. 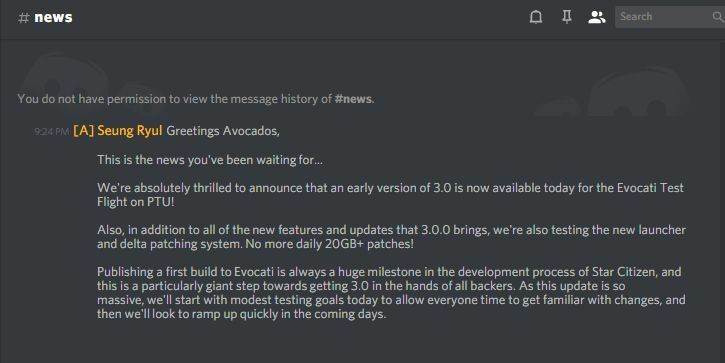 There’s no timeline or specifics on what is available, but testing ramp-up on Evocati is stated to happen in a matter of days. Looks like someone perhaps broke the Avocado NDA! Regardless, we’re sure that lots of fans of Star Citizen will be pleased to know that 3.0 is just that much closer to arriving to the wider playerbase sometime soon. Considering the hype and expectations leading up to this point, this could be big news for Star Citizen indeed. Glad to see the project is hitting it’s first major public milestone. They are still many months from getting any substantial gameplay, hitting a beta phase and releasing this single player campaign they are creating side by side with the online portion but at $160 million funding, I think we’re all hoping it will be worth the wait. The popcorn material from fans and detractors alike has kept this project interesting. Glad to see the project is hitting it's first major public milestone. They are still many months from getting any substantial gameplay, hitting a beta phase and releasing this single player campaign they are creating side by side with the online portion but at $160 million funding, I think we're all hoping it will be worth the wait. The popcorn material from fans and detractors alike has kept this project interesting. I’m ashamed to admit it, but the drama llamas that roam the fields of this game’s fanbase on both sides have been, for the most part, entertaining. With some few “Smart” exceptions. I'm ashamed to admit it, but the drama llamas that roam the fields of this game's fanbase on both sides have been, for the most part, entertaining. With some few "Smart" exceptions.